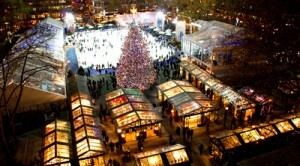 Some of the merriest Christmas shopping options can be found at the various Christmas markets throughout the city. Modeled after Christmas markets that are the rage throughout Europe, these markets bring people together to eat, drink gluhwein (hot spiced wine), and shop for local trinkets from now through the end of the year. After returning from visiting the Christmas markets in five European cities, I was eager to check out the ones here. 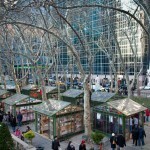 Of them, my favorite is the Winter Village at Bryant Park. It may not be as large as the one by Columbus Circle or the one at Union Square but it gets my vote for its variety of attractions. When you’re tired of shopping, there are many eating outlets, a convenient restroom, and there’s an ice skating rink that’s FREE. (Take that, Rockefeller Center!). Another plus: pretty much every form of transportation is nearby, from myriad subway lines to the bus down Fifth Avenue, and easy access to the trains from Grand Central Terminal. Among my favorite shopping booths, there are the unusual ones like “Don’t Chew” for all forms of melt-in-your-mouth chocolates, things made out of coins, and Brazilian home décor. You’ll also outfit yourself to the nines with everything warm with flannel pajamas, scarves, gloves, and hats galore. I also love the fact that Sabon has a branch here so I can do some quick shopping without having to find a storefront, and that you can stare up at the Christmas tree with a backdrop of the skyscrapers on Sixth Avenue. Food choices are pretty varied with Waffles and Dinges for those craving a sweet fix, or grilled cheese, arepas, and ‘wichcraft sandwiches to keep you satisfied. Although I didn’t find the alcoholic gluhwein that’s ubiquitous at European Christmas markets, there was a Bavarian stand with Sigmund’s Pretzels and another that sold a non-alcoholic version of hot wine and hot apple cider. Are you ready for the best foodie event in Manhattan? It’s not until March 25, but tickets are now on sale. The Village Voice’s “Choice Eats” always has about 60 restaurants to sample treats from, from 35 or more different ethnicities. To date, 26 restaurants have voiced their commitment including Bear, Bhatti Indian Grill, Bobwhite Lunch and Supper Counter, Brooklyn Koloache (love those savory and sweet pastries), Butter &amp; Scotch, Coppelia, Devi, Dirt Candy (vegetarians rejoice), Fletcher’s Brooklyn Barbecue, Indian Clove, Jimmy’s No. 43, Kaia Wine Bar, Louro, Luke’s Lobster, Mables Smokehouse, Maima’s Liberian Bistro, No. 7 Oda House, Ovelia Psistaria, Pete Zaaz, Queens Comfort, Red Hook Lobster Pound (is this your favorite or is it Luke’s? ), Robicelli’s, The Kati Roll Company, The Meatball Shop, Xe Mayu Sandwich Shop. Back by popular demand, “Choice Eats” will offer all ticketholders an array of dessert offerings in the “Choice Sweets” section of the event. March 25. www.villagevoice.com/choiceeats. Since this is the seventh event, you know it’s going to be a lucky one! The location this year is new (not the 69th Armory as in the past): Basketball City at Pier 36 in Lower Manhattan (299 South Street). Three hours of eating from 7-10pm, with a VIP-only hour from 6-7pm. Tickets are $60 for General Admission, or $85 with the VIP sign-up. New this year, “Choice Eats” will be accepting volunteers to assist The Village Voice team on-site at the event. In addition, to free entry to “Choice Eats,” this is a pretty cool way to get a free general admission ticket to The Village Voice’s Third annual “Choice Streets” Food Truck Tasting Event to be held later this year in May. To apply, you must be 21 years or older and fill out this application, http://bit.ly/CEvolunteer. Held in Red Hook (Brooklyn) at “heated” Pier 12, the Taste of the NFL is holding its annual party, with lots of celebrity chefs fêting their favorite NFL team, each with a special dish. This year’s event – no surprise – is being held the night before the Super Bowl. As a nod to the Super Bowl’s straggling both New York and New Jersey, there will also be a special appearance this year from cast members of TLC’s “Cake Boss.” Proceeds go to local food banks in NFL cities. 72 Bowne Street, Brooklyn. Valentine’s Day is a day to remind your sweetie how much you care. Here are some innovative ideas for creating an evening to remember in New York City. 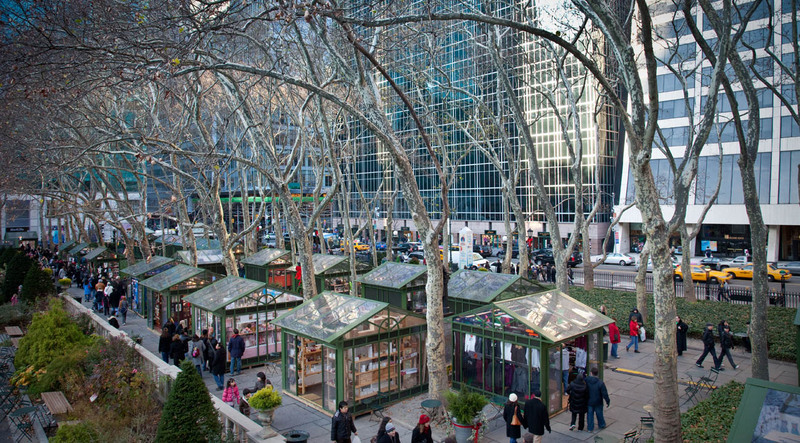 Christmas cheer is everywhere in New York City. Christmas tree sellers are out on public sidewalks and department store windows are inventively festooned. Rockefeller Center is filled with beautiful skaters and visitors ogling the stunningly lit tree. But it’s the outdoor less-crowded shopping at the holiday markets throughout the city that gets me jazzed.